When the key is in the ignition key cylinder or the door courtesy light on signal is output to the main body ecu, performing the door lock operation with the lock switch does not lock the door. 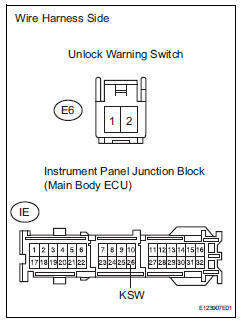 Use the data list to check if the unlock warning switch is functioning properly. Ok: when the switch is operating, the intelligent tester should display as shown in the table. 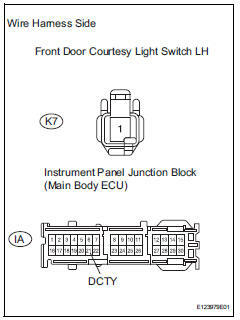 Use the data list to check if the door courtesy light switch is functioning properly. Remove the front door courtesy light switch. 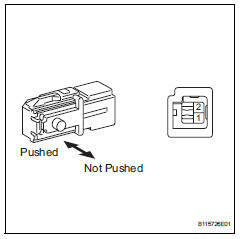 Disconnect the k7 switch connector. 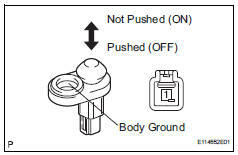 Disconnect the ia junction block connector. Disconnect the ie junction block connector.